I’m going to break from my usual format for this review, and instead of analyzing the details of this episode that no one cares about, I’m going to focus mostly on these two thoughts. Sam and Dean have issues. I think there are two levels to what we’re seeing here – the emotional fallout from a betrayal of trust, and a fundamental difference in philosophy (which I’ll dig into in the second section). But first, I want to address the emotional part. Despite what Sam is currently saying, Sam and Dean are brothers, and family does lash out at each other in hurtful ways to degrees where politer friendships wouldn’t dare to go. While Sam inserted the knife last week, saying they could hunt together but wouldn’t be brothers, this week he turned it. Sam reminded and reaffirmed that they are not brothers anymore, suggested Dean keeps swooping in to save Sam because Dean can’t be alone, and finally said that if the circumstances were the same, he wouldn’t have done the same thing (tricked Dean into becoming possessed to save him). We mostly see Supernatural through Dean’s eyes. The first half of the season, while Dean was making the deal with the angel he presumed to be Ezekiel, we saw mostly Dean’s perspective and the guilt he was feeling. He knew he was doing something Sam wouldn’t want, and that Sam would eject the angel if he knew the truth. We also saw Dean express that he didn’t have a choice, and that he was doing what he had to do. And we got a full flashback episode reinforcing what we’ve learned in the past about Dean’s childhood – how he gave up a lot to be there for Sam. Now it was time for Sam’s reaction – and react, Sam did, with words that seemed to cut deeply into Dean’s heart and crush him. There has been a lot of backlash toward Sam in the fandom, so I want to start by addressing some of the comments I’ve been reading online. Sam does have an idea what Dean has given up for him. You can never totally know what’s in another person’s head, but Sam and Dean come about as close to understanding each other as people come. Sam knows that Dean is headed down a self-destructive path. You could see it on Sam’s face when Dean talked about needing to go off on his own because he was poison, and I’m also attributing Sam’s decision to stay close to Dean by continuing to hunt with him, even though he’s really, really angry at him, as concern. He’s still too angry to let Dean see that concern, so it comes out when Sam’s alone – such as hunting down a roofie-dropping cook at the resort. Sam saw and briefly reacted to the Mark of Cain, realizing it meant trouble. But it’s also likely that Sam wasn’t surprised by it. He knew Dean would do something self-destructive. Making unholy alliances that lead to more blood and hurt has become just another day on the job for them these days, but I’ll get more into this topic in the second section. And if there was any doubt that Sam noticed the Mark of Cain and understood it was significant, it was confirmed when Sam heard that Dean say he had been up all night researching it, and didn’t flinch. Sam knows that Dean can’t be alone, and that giving up his brother would crush him. Sam confirmed that when, in season 5, he made Dean promise to contact Lisa, and again at the end of season 6, when he chose to take in the Hell memories so that he could be there to support Dean. Sam also knows what family means to Dean, and that’s exactly why he told Dean that they wouldn’t be brothers, and reminded him again of it in this episode. Sam was deeply hurt by Dean actions and Dean isn’t even acknowledging the real problem. Dean says their friction will blow over with a couple of wins, and reminds Sam that he doesn’t break that easy. But that’s part of the problem. Sam needs to get Dean to break. Dean needs to realize the seriousness of what he did, and playing the brother card was one way to do that. Sam has good reason to feel hurt. While Dean has supported Sam through most of their lives, Sam has also supported Dean, although often without any acknowledgment or thanks. When Dean asked Sam to come with him to find their father in the pilot, Sam did, putting at risk an interview with Stanford (everything he had worked for) that was scheduled for after the weekend. Sam stood by Dean after Dean had sold his soul and tried what he could to get Dean back from Hell. He even attempted to trade places with Dean in Hell. When Sam wanted to die at the close of season 6, and move on to a happy fantasy existence with Jess or the bartender, Sam chose to take back his Hell memories and return to living so that Dean wouldn’t be left alone. And when he thought Dean was in danger in Repo Man, Sam “let in” his Lucifer hallucination because he thought it could help him tap into information that he had for forgotten so that could help Dean. He’s repeatedly asked Dean for respect and to be treated as an equal partner, and while Dean has moments of doing this, he often reverts back to making decisions for Sam and blaming Sam even for things Sam had little control over – for example his soullessness and letting Lucifer out of the cage (they both know that Sam couldn’t have known that killing Lilith would let Lucifer free). Dean is still referring to Sam’s alliance with Ruby a betrayal even though the two things that might constitute a betrayal (lying and working with a demon) are things Dean has also done many times over. Sam: Yeah, well, you're a hypocrite, Dean. How did you feel when Dad sold his soul for you? 'Cause I was there. I remember. You were twisted, and broken. And now you go and do the same thing. To me. What you did was selfish. Dean: Yeah, you're right. It was selfish. But I'm okay with that. Sam: I'm not. Dean: Tough. After everything I've done for this family, I think I'm entitled. Truth is, I'm tired, Sam. I don't know, it's like there's a, a light at the end of the tunnel. It’s hard to imagine that dying, and even going to Hell, would be the easier choice, but for the Winchester family it has been the preferred one. While John was willing to sacrifice himself, he was not willing to sacrifice Dean. And while Dean was willing to sacrifice himself, he was not willing to sacrifice Sam. Were the actions selfish? 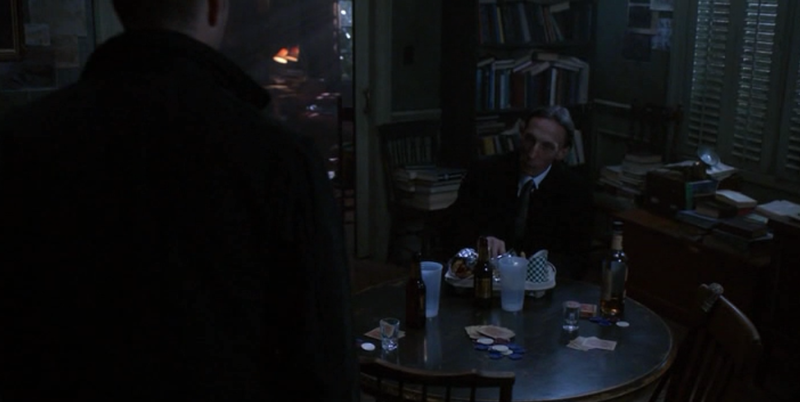 In season one’s Devil’s Trap, Dean turns the discussion around and accuses Sam and John of being the selfish ones in trying to sacrifice themselves to get the demon. It’s a complicated question, and the issue may comes down to the fact that while hunting, Sam and Dean are taking on more risk they’re comfortable accepting. They’re all in when it comes to sacrificing themselves, but family is their weakness. And that brings us to section 2. When this show started, things were more simple. In the season one episode Faith, both Sam and Dean were horrified by finding out that someone had lost his life so that Dean could live. But gradually, their attitudes shifted. While both remained heroes in that they were willing to sacrifice their own lives to get the bad buy, they lost their way facing consequences of losing a brother. When that happened, they waffled and backed out, even if that meant much worse consequences than the ones they originally sought to fix. We’ve seen over and over that the cost of saving one family member’s life has resulted in the deaths of several, if not many more, innocent people. And it has also led to unholy alliances with evil supernatural creatures that Sam, Dean, and John would have never imagined that they would be dealing with in season one. Examples are Dean’s deal with the crossroads demon to bring Sam back, Sam’s alliance with Ruby, Sam’s willingness to work with the Lucifer hallucination, and now we see Dean not only working with Crowley, but bearing the Mark of Cain – a symbol of murder. Watching this past episode, I was reminded the season 1 finale Devil’s Trap – a fitting name for where I think the escalation of this all really began. In Devil’s Trap the debate around the question – should they sacrifice family for the hunt – came to a head. In was then that the sides were formed. On one side stood John, who at least in Sam and Dean’s perception of him, wouldn’t want the Colt’s bullets wasted on the wrong demons to save his sons, if it meant losing their chance to kill YED. On the other side was Dean, who put family above the job. He tells Sam, “Killing that guy, killing Meg. I didn’t hesitate, I didn’t even flinch. For you or Dad, the things I’m willing to do or kill, it’s just, uh .... it scares me sometimes.” In the middle was Sam. 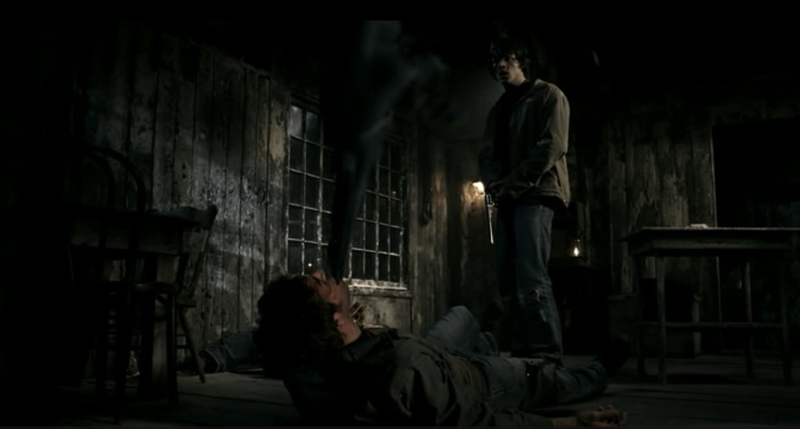 He starts off on John’s side of this debate, but when faced with the decision of whether to kill John with YED inside of him, Sam is pulled in two directions with John begging Sam to pull the trigger and Dean begging him not to. Sam listens to Dean, and his decision starts a chain of events that leads to John not only losing his life but being sent to Hell while YED lives, Sam dying, Dean selling his soul, the breaking of the seals, Sam going to Hell himself, and the chaos in Heaven that follows the Apocalypse. While Sam could very well be referring only to the angel possession in this dialogue, I read it as having a double meaning. I wanted to finish his sentence for him: “No, Dean. I wouldn’t. Same circumstances, I wouldn’t. [And I can say without hesitation because when you were in Purgatory, I had the opportunity to get you out but I made a deliberate choice not to. ]” I’m reading a lot more into this than what was said, but like a lot of fans, I felt Sam was being written as uncharacteristically evasive in his response to Dean regarding his actions following Dean’s disappearance. This explanation would make sense [sort of]. It would fit that he didn’t tell Dean that he chose not to get him out because he knew Dean wouldn’t understand, and that the knowledge would crush him. And the reason I put in the “sort of [makes sense]” qualifier above is that from season 4 through season 7, Sam was making the same type of decisions that Dean was. As late as Repo Man in season 7, Sam was making unholy alliances, such as with hallucination Lucifer, to save his brother. For this to make total sense, something needs to have happened to Sam between the time Dean disappeared into Purgatory and the time Dean reappeared, to bring Sam to where he is now. The show could still revisit this period through flashbacks or other storytelling devices to show us why Sam is done with using their Supernatural contacts to save each other. Or the show might have planned to frame Sam’s season 8 decision not to look for Dean this way, but afterward backed off because of fan backlash, and that they hadn’t planned for a trigger to explain Sam’s change in point of view. The show may instead be writing the Gadreel possession as the trigger that changes Sam’s perspective and stick with the explanation that Sam thought Dean was dead. Either way, Sam seems to be in the place of being committed both feet in now. And I think, when he made a comment implying that he resented Dean talking him out of closing the gates of Hell, he was as much mad at himself for listening to Dean as he was for Dean, once again, changing his mind once family was threatened. Sam started season 8, completely out of hunting. He was so out that he had ditched his phones. He was reluctant to start the quest for quest for shutting the gates of hell because he wasn’t sure he wanted to commit. But once he committed, he wanted to follow it to the end. And he accepted Dean’s earlier notion that Dean be the one to the do the trials – not happily, but he backed down until by a twist of fate he ended up killing the hellhound. For a long time we’ve seen Sam have differing opinions, but in the end following Dean’s lead. One major exception to this was when Sam allied with Ruby, but Sam ended up badly burned by this decision. I think what we saw was that Sam is done letting to Dean change his mind, and he’s ready to start asserting himself more in this relationship. When Carver rejoined the show as showrunner, he talked about a reset of the show, back to season 1. There has been lots of speculation as to what that means, but I suspect with a reaffirmed commitment to hunting both feet in – which means accepting the loss of family – we might be finally be seeing the results. But while it’s easy to jump to the conclusion that the preferred, “right” point of view according to the show is Sam’s current state of mind, I’m not sure that’s so clear. There’s been another message presented throughout the series, and that is that family makes them stronger. While love of family started the Apocalypse, it was strength from the family bond that ended it. Their actions started a ripple effect of bringing chaos to Heaven, but it also brought the angels choice, and Cas humanity. Also, just about every victory Sam and Dean has earned over the years has been followed by a worse consequence. Blood leads to more blood, Dean sees himself as a murderer. Also, we’re increasingly getting more point of view from the monsters we meet and being told they’re not much different from hunters. What I’m finding interesting is that while there was a triangle of sorts in season one related to opinions on hunting and accepting death, there seems to be a new triangle forming, with Cas taking up the role of advocate for nonviolence. 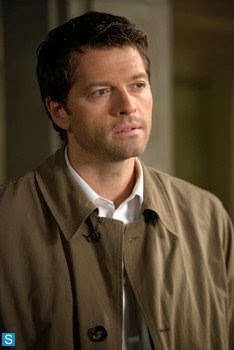 By becoming human, Cas is seeing the value of life through fresh eyes, and in the end, he may be the voice to argue that the solution isn’t dying for the cause, but rather walking away from it.